Alyssabeths Vintage Etsy shop features lovely Vintage Glass Cabochons or Flat Back Stones. Most of these little treasures were crafted in Japan or Germany during the 1940s to the 1960s. So versatile to use in your Jewelry and Mixed Media Art Creations. I love the wide range of styles of vintage cabochons - from solid color pressed glass, floral and picture decals, intaglios, and hand painted glass! Each piece is a little work of art on their own! Here's a small selection of the vintage glass cabochons you can find in my little shop AlyssabethsVintage. 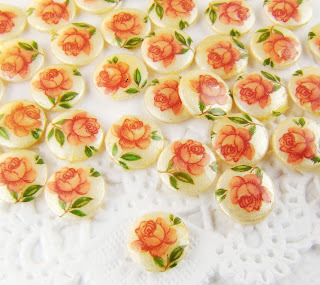 Set of 10 tiny 7mm Pink Rose decal cabochons with ivory pearl finish. Vintage glass cabs, made in Japan with flat backs, you will receive 10 per set! 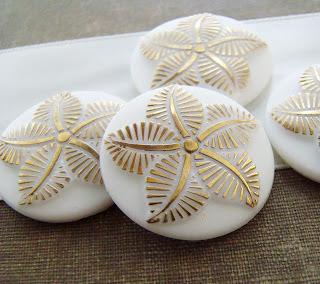 Chic vintage embossed glass, button top cabochons stones featuring gold feathered flower on chalk white textured background with flat backs. These actually remind me of Starfish. Vintage Czech came in original packaging so these are in perfect condition. You will receive 2 of these unique glass cabochons. 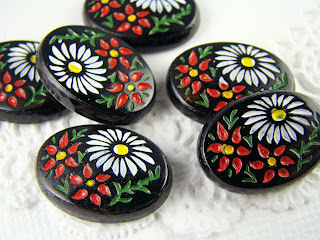 Vintage, pressed glass intaglio floral daisy cabochons 18x13mm black with flowers hand painted in yellow, green and red. These came in their original packaging and are in wonderful shape!Please note, that these are old, crafted in occupied Japan in the mid 1940s to early 1950s., You will receive 2 cabochons. 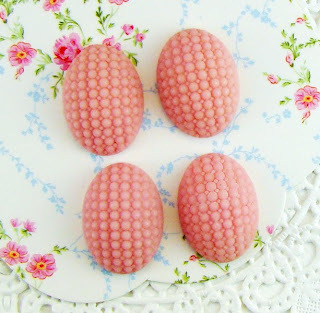 Matte finish opaque cotton candy pink glass quilted textured 18x13 oval cabochons. Vintage West German, featuring concave backs with rims for gluing. You will receive 4 of these Shabby Chic glass cabs! 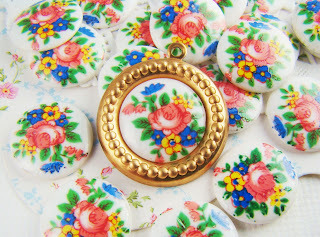 Vintage 13mm round flower rose bouquet limoge style decal glass cabochons, cameos. Very old, made in Japan with milk glass white flat back base adorned with multi-color flower decals in pink, blue, green and yellow. I also have these in 10x8mm oval cabochons!